Through increased support for population health initiatives, Vanderbilt University Medical Center (VUMC) is positioning for a health care economy that rewards long-term relationships with patients through better engagement and emphasizes improving health management for large groups. Jeff Balser, M.D., Ph.D., vice chancellor for Health Affairs and dean of the School of Medicine, told those gathered for last week’s Summer Clinical Enterprise Leadership Assembly that VUMC is investing in people, process improvements, and technology to make it easier for health care providers and patients to engage, wherever they happen to be. New website and smartphone tools are just the beginning of an effort to engage with the patient on their terms, “no matter where they are, 24/7,” Balser said. The investments come as health care payment models across the country are shifting toward a focus on population health and incentivizing better outcomes and lower costs for lengthy episodes of care, often referred to as bundled payments. Those changes are a good thing, Balser said, since the Medical Center’s values, existing strengths and future plans for improving population health are mutually supportive. During the next decade, as the nation’s hospitals align or consolidate to form integrated health systems, continuous patient engagement and access will play a major role in the Medical Center’s success, Balser said. 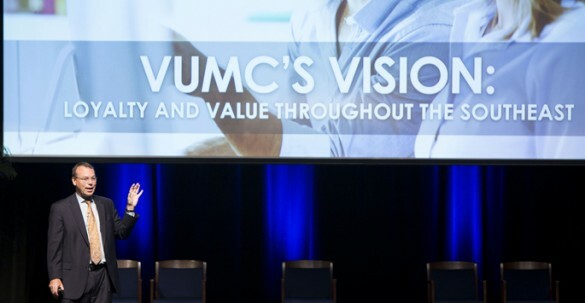 C. Wright Pinson, MBA, M.D., deputy vice chancellor for Health Affairs and CEO of the Vanderbilt Health System, provided an update on VUMC’s performance regarding 2015 Pillar goals and thanked faculty and staff for the progress that was made last year toward meeting those goals. 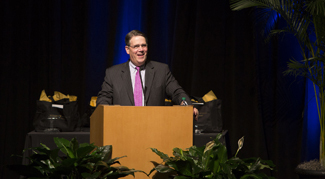 He presented new goals for fiscal year 2016, and outlined several initiatives aimed at improving efficiency and patient care across the clinical enterprise: decreasing length of stay, increasing procedure volumes through the pipeline initiative, improving documentation and coding excellence, and continued focus on the people of VUMC. He provided examples of why each initiative is so important. “I want to stress how little changes can make a huge difference,” he said. For example, in the Adult Hospital alone, decreasing length of stay by 6 percent has the effect of adding 33 new hospital beds of additional capacity, Pinson said. The initiative will reduce how often patients are diverted to other hospitals and improve wait times in the Adult Emergency Department all while getting patients back home with their families quicker, he said. He referenced a project moving forward to provide a regularly-updated estimated time of discharge to allow the care team to complete tasks — such as coordinating transportation and filling discharge medication — as early as possible to decrease delays. “We need everybody’s help to focus on this to help make it happen,” Pinson said. The assembly finished with a presentation by Jenny Cordina from McKinsey & Company on consumer trends in the health care industry, followed by a panel discussion from VUMC leaders on initiatives ranging from patient experience to efforts to grow VUMC leadership in the health care marketplace. A video and slides from the Leadership Assembly presentation are available on the Elevate website at http://www.mc.vanderbilt.edu/root/vumc.php?site=Elevatesite.